Hijab is not a recent issue and hasn’t been created by the modern man, but it is as old as the Abrahamic religions. “Women’s covering” is the common practice among all the Abrahamic religions such as Judaism, Christianity and Islam, and it is an understanding that has been affirmed by all of them. Comparing with other religions which are much stricter on women’s Hijab, Islam has a more moderate view toward this issue. However we often see that some people cast doubts on this issue maliciously and probably ignorantly. Spreading these doubts and accusations has damaged the place of Hijab and nobody has paid attention to it as it deserves in the Islamic society. Hijab impedes man’s progress. Reza Khan (one of the kings in Iran in the past) had also the same attitude and he ordered the unveiling of the Iranian women based on this idea. There are no verses in the Quran indicating the obligation of Hijab\ but if they do, they don’t suggest (imply) covering the hair, etc. Hijab makes people greedy, so People should be free because they are keen to do what they have been prevented from. Hijab was not obligatory at the time of the Prophet (PBUH). Some ask why women are always required to cover themselves! They are men who should lower their gaze. Hijab is limitation not protection. If I wear Hijab no man would propose to me for marriage. Some women state that they have to be without Hijab and always wear makeup for protecting their husbands who are busy with watching (corrupt) satellite channels! These doubts and objections which are being propagated in universities and scientific circles not only undermine the public opinion on such a crucial Quranic law but also marginalize one of the important teachings of the Quran. This paper is an attempt to shed some light on the issue of Hijab from the point of view of the Islamic texts (i.e. the Qur’an, hadith) and other religions, as well as to clarify the reasoning behind Hijab and to find the problems caused by lack of Hijab. As it was mentioned above, all religions have pointed to the important status of Hijab. The only difference is in the philosophy of Hijab and the limits of covering (regarding the parts of the body which are supposed to be covered). Let’s take a look at some of the rulings in other religions. Regarding the special covering of the Women of Israel, they used to wear chador to cover their whole body as well as veils to hide their face. In his book «The Jewish Women in Rabbinic Literature», Dr. Menachem Brayer, the Professor of Biblical Literature at Yeshiva University, has stated that it was the custom of Jewish women to appear in public with a covering which covered the head even the whole face leaving only one eye free. The women’s clothes should be loose in a way that they do not show the shape (contour) of their body. They should not wear dresses with belt. In addition, he talks about covering the neck and ankle; they should cover around the neck and the ankles. Even The skin should not be visible through the socks; socks should not have pictures on them or have unsuitable colors (it should be noticed that these kinds of coverings are for married women, and the Single girls have special coverings before marriage in Judaism). Not only did Christianity continue the Jewish traditions regarding Hijab but also it endorsed them. In some cases, it has gone further and addressed the issue with strict emphasis on the importance of modesty and Hijab because Christianity, unlike Judaism in which marriage (family life) is vitally important, holds out singleness as a great blessing. According to the Church leaders, those who taste sexual pleasure even once in their life will be deprived of the blessings of God (Heaven) forever. Thus, certain rules such as wearing Hijab, avoiding makeup and provocative clothes are highly encouraged to be abided by women in Christianity. Because spirituality and abstaining from worldly pleasures (material things) are one of the principles of Christianity. 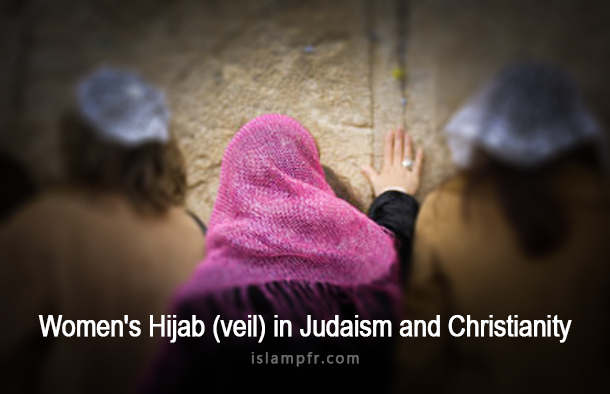 There are two verses of the Quran that deal with Hijab and Muslim women’s covering. . In one verse Muslim women are prohibited from displaying and showing off their beauties. Each verse presents certain rulings on Muslim women’s clothing. Explaining the verse itself along with the concepts established in hadith shapes our understanding of the rules defining women’s dress. What verses in the Quran are about Hijab? 1- They should not display their ornaments except those that are naturally visible «وَلَا یُبْدِینَ زِینَتَهُنَّ إِلَّا مَا ظَهَرَ مِنْهَا». So they are not allowed to show their ornaments that are usually hidden or worn under their casual dress. According to the Quran, women are prohibited from displaying such beauties. 2- The second statement «وَلْیَضْرِبْنَ بِخُمُرِهِنَّ عَلَى جُیُوبِهِنَّ» commands women to draw their khumur over their bosoms, ‘Khumur’ is the plural form of ‘khimar’ which means covering (scarf). It usually refers to a piece of cloth which covers all of the hair. Furthermore, the word juyoob (plural of jaib) refers not only to the collar but also to the neck and sometimes to the upper part of the bosoms. What is understood from this sentence is that women (prior to the revelation of this verse) used to cover their heads with scarf, throwing its ends on their backs, in a way in which it left the neck and the upper part of the chest bare. Allah commands them to throw their scarves over their bosoms to conceal the hair, the neck and the bosoms. What can be concluded so far is the clear command for women to cover their hair, neck and bosoms. But the next verse explains how to cover the rest of the women’s body using the word ‘Jilbab’. O Prophet! Tell thy wives and daughters, and the believing women, that they should cast their outer garments over their persons (when abroad): that is most convenient, that they should be known (as such) and not molested. And Allah is Oft-Forgiving, Most Merciful. What is obvious here is that Jilbab is a full-body-length garment like Chador which covers from head to toe. Although there are various interpretations on the meaning of the jilbab, nevertheless scholars asserted that the word refers to a loose, full-covering clothing that covers the face and the whole body. So this aye indicates that the Muslim women’s clothing should not be sheer (transparent) and tight in a way that reveals their body shape. Some people insist on proving Hijab based only on the Quran. In response, it should be noted that the Quran and hadiths are inextricably linked so our religion comprises rulings and commandments that are clearly set out in the Quran and has been explained in Hadiths. 1- It is narrated in the fifth volume of the book “Furu’al-Kafi”, that Al-Fudayl ibn Yasar asked Imam al-Sadiq ( PBUH) about the forearms of a woman whether they are included in the “beauty” or not? As it is described by the Almighty when He says, “and they should not display their beauty except for their husbands…”. The Imam replied, “Yes, and the whole body of the woman except the face and the hands up to the wrists, all are considered as her beauties (which must be covered from those whose names haven’t been mentioned in Surah Al-Noor, Aye 31). 2-Imam al-Sadiq (PBUH) says: “Fasting and Hijab are obligatory for the girl who reaches the age of puberty.” – Wasail al-Shi’a, vol. 4. 3- According to a hadith narrated in Bihar al-Anwar, vol. 100, about the agony of the sinful women, the Messenger of Allah ( PBUH) says: “… but the woman who was hung by her hair, it was because she walked outside freely, exposing and revealing her hair to strange men. 5- According to a hadith narrated in Tahdhib al-Akhlaq(Vol.7), the Prophet Muhammad (PBUH) described the best woman as the one who wears makeup and display s her beauties for her husband and cover s herself from others and the worst is the one who wears makeup and displays herself for others while covers herself from her husband at his presence. Note: It is fair to say that Islam has a moderate view toward Hijab and it has balanced this type of instinct (as it is mentioned in Al-Mizan Interpretation by Allameh Tabataba’i), but it is required to talk more about this issue in the philosophy of Hijab.